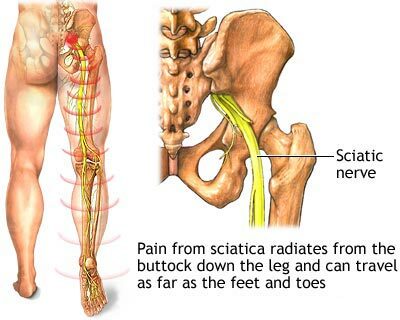 Physical therapy plays a great role in treating sciatica. Once the acute pain gets away, you and your physical therapist can design a physical rehabilitation program in order to help you strengthen your muscles, improve the posture, improve the flexibility and prevent any further damages to your spine. Bone spur on the spine, etc. This causes inflammation and pain often accompanied also with numbness of the affected leg, due to the fact that the sciatic nerve becomes pinched. In very rare cases this nerve can get compressed by a tumor of the nearby areas or it can get damaged due to diabetes. People who are obese, have diabetes, sit for a long period of time during a day, or have a job that requires a lot of heavy lifting or drive for long periods have a greater risk of suffering from sciatic nerve problems than others. A characteristic sign of this condition is pain which is first localized on the lower back (the lumbar part of the spine). The intensity of the pain varies from mild, moderate to severe and this pain irradiates to the buttocks and down the back of the leg to the toes. Sitting for a long period of time can make the pain get worse. Some people also refer to have numbness, tingling or even muscle weakness of the affected leg. Usually mild to moderate cases resolve on their own over the time and do not require treatment. However, if this pain does not go away after a week with over the counter pain killers, if this pain gets worse or becomes progressively worse you should seek medical help. Urgent medical care is necessary in cases when you have sudden and severe pain of the lower back or one side of the leg due to a trauma or work injury, especially in cases of car accidents, you have trouble controlling the bladder and if this sudden pain is also accompanied with numbness and muscle weakness. Even though most of the people affected with sciatic problems fully recover with or without necessary treatment, in some cases it can lead to permanent nerve damage. This is more likely to occur in cases of trauma or injury of the lower back, when pain is accompanied with numbness of the affected area and when there is also a loss of bladder control. Physical therapy treatment plays a great role in treating sciatica. Once the acute pain gets away, you and your doctor can design a physical rehabilitation program in order to help you strengthen your muscles, improve the posture, improve the flexibility and prevent any further damages to your spine. Steroid injections such as Cervical Epidural Steroid Injections, Lumbar Epidural Steroid Injections, Caudal Epidural Steroid Injections into the area around the nerve root are also often recommended. These injections help reduce the pain by suppressing the inflammation of the nerve. The most advanced pain management and physical therapy center. Brooklyn physical therapy doctors and specialists at Pain Physicians NY offer unique, individualized approach to manage Sciatica nerve pain.